We’ve seen an increase in a couple of Ball cards that have surprised me lately. 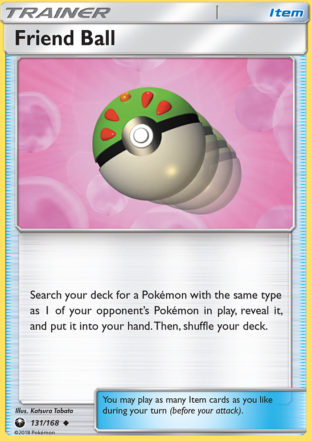 Great Ball has popped up in a few successful lists, but the card that has me particularly interested is Friend Ball. I had thought that this card would fall somewhere between completely worthless and barely useful, and yet there were a pair of them in the 2nd place list in Philly. This surprised me, but I can completely quantify this: what are the most common Pokemon out there today, and are there commonalities among them that might make Friend Ball more playable? So the first thing that stuck out to me was that two of the top three most common Pokemon are Fighting weak… but I went over that on Monday. Three of the top five are Psychic Pokemon, and this appears to support Rukan Shao’s inclusion of Friend Ball as a good tech in decks that are running Psychic Pokemon. Here’s where there are statistics within statistics, however. You can’t just add 78 + 25 + 27 and say that in 130 matches, your opponent played a Psychic Pokemon. Some of those will overlap – and I really can’t take the time to count all of them, I’d have to do that manually. Moreover, this is out of 317 matches… even if it were 130, it’d only be 41% of the matches I came across. In fairness, there are other Psychic Pokemon on this list… however, most of them are going to overlap as well. Bottom line: on PTCGO, I just don’t know how much of a friend this card will be for you. I think that in most games, you either won’t be able to use it or you won’t be able to get the card you need with it. Want evidence for Friend Ball? If you look at the lists from Philly, you have to go all the way down to 16th place before you find a deck that does not have a Psychic Pokemon. Granted, most of them are Tapu Lele GX, but how often do we play down Lele turn 1 or turn 2 to ensure we get off to the start we want? Moreover, I can definitely say that in 92 of those 317 matches that I played, my opponent’s Oranguru was on the board early. So if you’re running Psychic and Colorless Pokemon, and you don’t care specifically which you get, all of a sudden, Friend Ball is looking like your old college fraternity drinking buddy. And if you’re running an archetype that has Psychic / Fighting / and Colorless Pokemon, Friend Ball is your BFF always and forever inseparable next door neighbor where you were basically treated their parents as your second family. Now if there was only a Psychic Fighting Colorless and even Fire archetype that was any good right now…. So you decide for yourself. If your looking for a new friend, maybe this green and red guy is your answer.